Nowadays all the administration tasks are rapidly moving to automation and its reducing manpower, cost and time. It’s mandatory to learn any one of the scripting and anyone of automation tool for system administrators at this situation. Automating tasks in server end is very critical and most important one. There are lots of tools available for automation. Here we are going to see the puppet. It’s an open source tool and developed by puppet labs for Linux/Unix/Mac and Windows machines. Puppet is written in Ruby language and its mostly used for automating jobs in the server and automating the jobs from the server to clients. To avoid duplication of work. To make speed and repeated changes automatically. Very easy to manage vm, cloud and physical machines. System time should be set as accurately on server, which is going to act as master chef server. So, set the time in your server. Make sure that both the master and agent server should resolev the hostnames. So, make an entry in /etc/hosts file. once time fixed will enable EPEL repository by using below command. To setup puppet master/node now we need to enable the puppet lab repository and dependencies and run it on both master and agent servers. Use the below command to install Puppet server. This will install init script (/etc/init.d/puppetmaster) to run a test-quality puppet master server. Now we need to configure the puppet master/agent architecture. in our case this node going to work as master server. So, edit /etc/puppet/puppet.conf file and change the dns_alt_names. Once received “Notice: Starting Puppet master version 3.8.7” press ctrl+c to kill the process. Puppet comes with basic web server. In production basically will not use this web server. Before managing nodes by puppet master server, will configure web server first. create parent, public and tmp directories for the application. Copy the ext/rack/config.ru from the puppet source code into the parent directory and set ownership as puppet to the directory. Create configuration file to add virtual host for puppet. make the below entries in virtual host file. Enable apache and disable puppet to autostart while booting. before starting puppet agent installation have to configure yum repository same like master server. Make master puppet server details in puppet configuration file like below. Now start puppet service in node machine and enable it to start automatically while booting in this run level. Agent node will request certificate on first time they attempt to run. Login and execute the below command in master puppet server. Run below command in puppet agent node machine to verify the certificate. Finally we completed puppet master and agent configuration successfully. Will see the Booting process in RHEL7/ CentOS 7 in this post. It’s very important to know the booting process for all operating system. It will help us to troubleshoot the booting issues. We are going to see about RHEL / Cent OS 7 booting process. It will do a POST (Power on self-test) to check system hardware. And it will search, load and execute MBR in memory(Master Boot Recorder). MBR Stands for Master boot recorder. MBR will be available in first 512 bytes of the boot drive. In this 512 bytes 446 bytes contains boot loader information, in 64 bytes contains partition table information available and remaining 2 bytes for MBR validation check. Boot drive will be anything like Hard disk, Pendrive, Floppy. MBR will search and load the GRUB2 boot loader in memory and control moved to the bootloader. GRUB will be the default boot loader in RHEL7. GRUB configuration file is available in this path: /boot/grub2/grub.cfg. Editing this file directly is not advisable. To change these configuration settings will edit this /etc/default/grub file. Once modified have to execute the below command to make this change affect in the main configuration file (/boot/grub2/grub.cfg). grub has kernel image(vmlinuz) and initramfs image details. 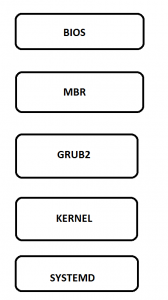 grub will search and load the kernel image into memory and it will extract the initramfs image contents into memory based filesystem which is called tmpfs. initial ramdisk will load the block devices (HDD, CD, Floppy, etc). So that it will find the exact root filesystem and will mount it. Till mounting this exact root filesystem, initramfs will act as a temporary root filesystem. kernel mounts the initramfs image as two-stage boot process. Will use the lsinitrd command to view initramfs content. Kernel will start systemd process and PID is 1 for this, as this will be the first process. Systemd will be the first process. This process will read the /etc/systemd/system/default.target file to determine the default system target. The system target file defines the services which is started by systemd. Systemd will bring the system based on the system target runlevel and perform system initialization process such as hostname, network settings, initializing SELinux, Printing welcome banner and mounting all filesystems.